Ron White Racing traveled south to the Streets of Lancaster Grand Prix on September 26-27, developing its race team program as an official factory-assisted CRG squad. The seventh annual street race served as the finale to the Superkarts! USA California ProKart Challenge program, welcoming top drivers from many regions along the western half of the United States. 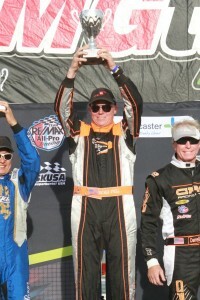 RWR operation represented the CRG brand at the event, with two drivers coming away with podium results. Patrick O’Neill became a first time winner in the new S4 Super Master Stock Moto division, while White himself piloted a CRG machine to a third-place finish in the headline S1 Pro Stock Moto category. O’Neill registered for the new S4 Super Master Stock Moto category after finishing 11th in last year’s Streets of Lancaster Grand Prix in the regular S4 division. Patrick opened up the event qualifying fourth in class, and retained the fourth position through the opening heat race that closed out Saturday’s action. Sunday faired the same in the morning as O’Neill ran to fourth in Heat #2, setting up for a solid starting position for the main event. Throughout the two heat races, the pace set by O’Neill was consistent, keeping the lap times very similar throughout the 10-lap races. Patrick got through the tricky opening laps of the main event, slotting himself into the third position. As they reached the halfway point, O’Neill began moving forward. Into the second position by lap 12, Patrick was on the rear bumper of the leader and pressuring for the spot. He completed a pass on lap 17, and was able hold on for the remaining laps and corners to secure the inaugural S4 Super Master win at the Streets of Lancaster Grand Prix and his first ever Superkarts! USA victory. White entered the event as the defending race winner in the S1 category, placing runner-up overall. Ron was quick off the trailer, among the top drivers on the dusty and green race-track. Strapping on new MG Tires for the qualifying session, White found himself in the fourth position when the checkered flag waved, leaving work to be done in the heat races. Ron gained one position in the opening heat race to close out Saturday’s competition, and gained another in a terrific fight in Sunday’s Heat #2. The second place result landed White on the front row for the main event. White held onto the position through the opening laps, and pressured the leader early on. Ron would fight strong to remain in the second position until slipping back to the third spot on lap seven. For an instance, White lost the draft of the two leaders but was able to put in some consistent laps and close up in the final lap. No moves for position held, and it was a third place result to give White his second straight podium at the Streets of Lancaster, helping build the confidence for the SuperNationals. 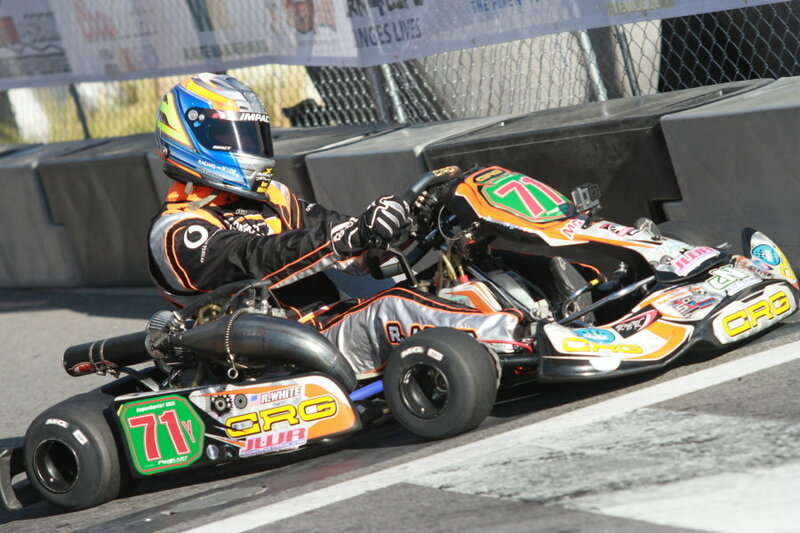 Ron White Racing continues to support the Sanzaru Games Karting Championships and all CRG drivers in the Northern California area. The next event is scheduled for the Simraceway Performance Karting Center on October 10-11 in Sonoma, California. For more information on Ron White Racing, please contact Ron White at 408-425-1102 or email ronwhite71@aol.com. Ron White Racing is owned and operated by veteran driver Ron White. The White family has been in karting for over 30 years, beginning in the Northern California area before branching out to the national tours. Ron has competed in nearly every form of the sport, winning at every level. White has worked with numerous drivers throughout the NorCal region to help build their knowledge base both on and off the track, and is continuing to expand his reach to the national level. The RWR operation is focused on the Sanzaru Games Karting Championships, the Superkarts! USA Pro Tour and selected events throughout California.